eCut 6 - Help. Start-up noname plotter. Здесь вы найдете ответы на самые частые вопросы по использованию программы. Running an unnamed (or with name) Chinese plotter. This article will be useful to you if your order got plotter from under heaven, and it is not clear which side actually approach it. Typically inside these plotters are very similar and are made of the same components, so you can generally start to generalize the issue and try to get to work on a human being. First plotter must be connected to a PC, be sure to use this for the COM port, if you use a USB or adapter USB-> COM then this article will not help you, and can continue to read just for the sake to broaden their outlook. Secondly you need to know the number of the COM port to which you connect the plotter. If you do not know, it's not a very big problem, the port number can be determined empirically. Third, if the plotter has a connection setup via COM port, these settings need to write - in the future we need them. The configuration of the iron can be said is complete and you are ready to configure the software. The first thing to do - is to run the program eCOM, which comes complete with eCut. This program lies in the folder c: \ eCut. In this program, open the OPTIONS / COM PORT and set values com port. 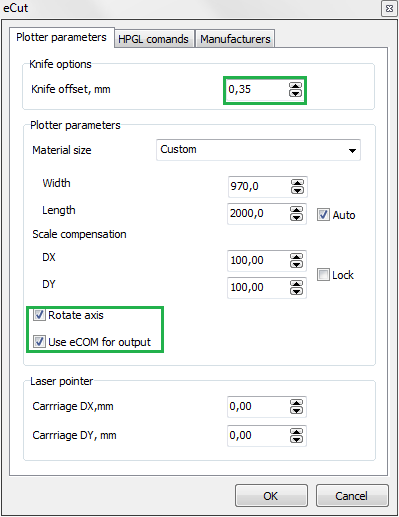 If you are the unknown parameters of the port, then only need to change the com port number, leave the other options intact, but if your plotter has a custom connection settings - here you need to set the values that shows the plotter. But usually, Chinese plotters do not have such settings and in most cases, the defaults. If at this point you are not sure you have specified the correct com port number or not - then move on, even if you make a mistake, you figure it out later and be able to change it to the right. You can now close eCOM and run Corel. 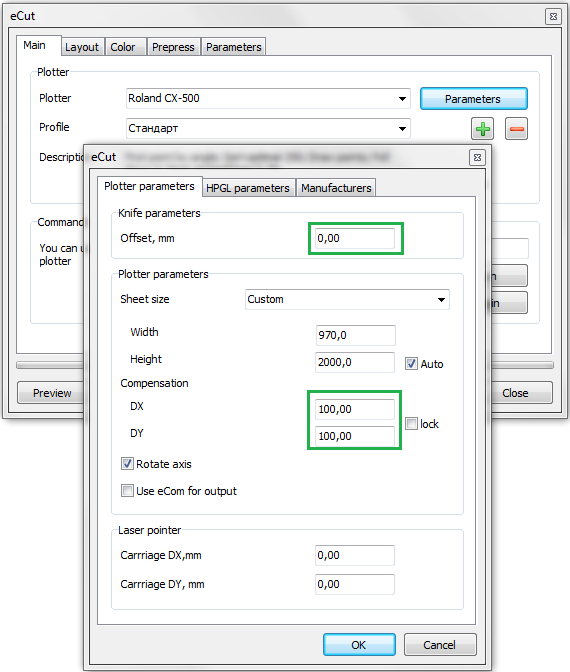 Create a simple object and run the function cutting panel ekuta. 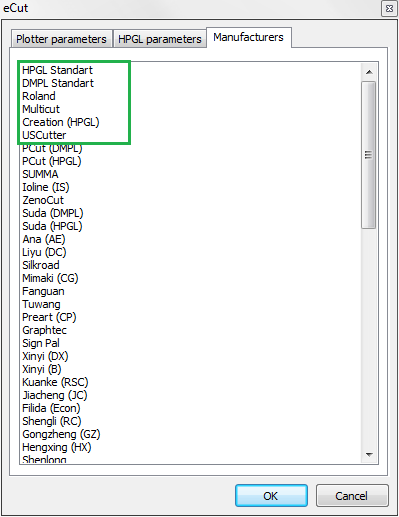 In the list of plotters select FILE - it will be the last in the list available and click the "Settings"
Check "Use eCom for output"
Open manufacturers list and search your plotter here. If you do not see your plotter - do not despair and choose first - HPGL. If these settings do not work, then in the future they will need to change. Save your changes and click "Print" on the main window of the print function. 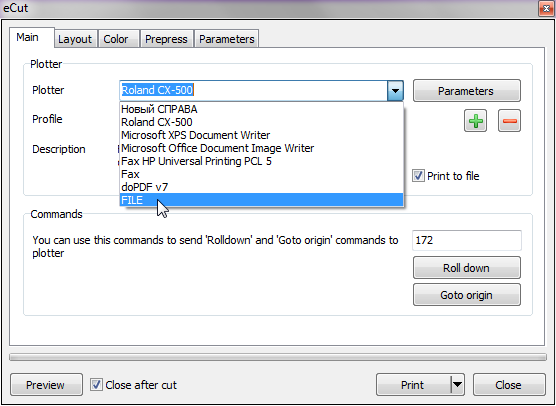 Once you hit the "print" will start automatically eCOM - it will appear in the taskbar, and if the port settings have been set correctly, the program will upload a file to the plotter and close itself. Need to check all the printers in the system that no one of them has not been assigned to your COM port, it needs to open the Start / Control Panel / Printers and Faxes, and for each printer go to the properties / port and see which port is configured printer. If the program is closed, and began cutting plotter - Hurray! things work, you can begin to everyday working weekdays, but be sure to read up to the end - there are a few points that you need to check. You will be allocated a plotter named FILE - click the "Settings"
If you are after these works plotter not earned - it is impossible to run, sorry. wait until the cutting - it will be long, but it is very important! if everything is OK - then again, Hurray! As a rule, the Chinese plotters do not have in their arsenal of vacuum pressing, and even if it is - it is just a hint of what should be the ideal. Due to the lack of a clip, very often there are "burrs" when cutting - this is when the initial point of the curve does not coincide with the end, and in this place the material just simply does not cut! 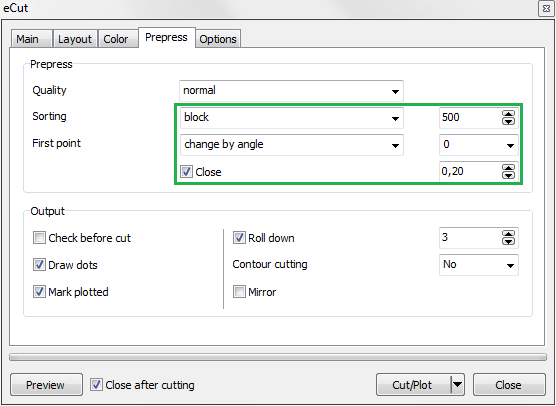 It is possible to try to get around with the help of the proposed eCut settings, here we go: The first step is to correctly set the Offset blade configured plotter. Chinese plotters usually do not support this feature hardware-based, so it has to be emulated in software. I also want to note the fact that the offset can range from 0.2 to 0.4 mm, below and above (as if suddenly beyond these limits, it is not much), so that the selection of this parameter must begin with the digits 0 3, and if the edges are obtained by a rounded - tsyfry then necessary to increase, and vice versa. And then there is the Chinese one particular, not all of them in the correct output obktov mastshtabe m, the compression ratio / stretching along different axes can be different - apparently gears with different gear ratios were only ... but it is not a problem, eCut may is correct, the corresponding coefficients can vystvait immediately - in the Plotter. Next, you need to set this parameter is not unimportant for the Chinese as "change the starting point of the curve." This feature is only ekute (know-how so to speak, in other software did not meet). It allows to make the knife beginning to curve under the same angle, which allows to "hide" the entry point, and, consequently, improve the quality of output curves. Highly recommended "to change the entry point in the corner", where the angle is 0 degrees (sometimes 90, to be tried on a particular plotter). And lastly, it is important to expose ARHI sorting output to plotter not rushed from one edge of the film to the other. I use a block length 500 mm, but in the case of the Chinese recommend not exceed 200mm - in this case, the plotter will do more horizontal movement of the carriage, rather than vertical - it allows you to accumulate less static electricity, they fear. So I borrowed a ArtCut a useful option as "Close", I called it "overlap". It allows you to cover the curve, making the starting point even more discreet, as well as improve the quality of "sampling" of the film. Here in general and all - if you have questions, please - I will be glad to spososbstvovat to configure your plotter. Set Baud rate - 38400.